The Philippine Robotics team, which represented the country in the World Robotics Olympiad 2015 (WRO 2015) held last November 6 to 8 in Doha, Qatar, once again showed the world their advanced skills in robotics systems. The Philippine team brought home an impressive list of achievements. Out of 478 teams from 47 countries, they were 10th at the rankings for the Technical/Regular category for the elementary level, 12th at the Open/Creative category for the high school level, and two of the teams made the Top 16 at the Robot Soccer competition. The Philippine representatives who comprised the robotics team came from thirteen schools across the country: Benigno Ninoy Aquino High School, Cavite National Science High School, Cebu Robotics Society, Claret School of Quezon City, Dr. Caridad C. Labe Education CentrEx Inc., Dr. Yanga's Colleges Inc., Francisco Benitez Elementary School, JJAL Robotics Workshop Inc., Mater Dei Academy, Philippine Science High School-Bicol Region Campus, Philippine Science High School-Cagayan Valley Campus, Philippine Science High School-Eastern Visayas Campus, Science & Technology Education Center Inc., Smartkids Enhancement Center, and St. Augustine International School-Calbayog. "It's wonderful, seeing how so many young minds generate innovative ideas, and make real change using the science of robotics," said Mylene Abiva, National Organizer of Philippine Robotics Olympiad and the president/CEO of FELTA Multi-Media Inc. The organizers of Philippine Olympiad host these tournaments in order to regularly coax ideas from the deep imaginative and creative processes of the robotics teams that join their competitions, year after year. “The Philippine teams who won PRO are actually regarded as major contenders in the World Robotics Olympiad. We have set that reputation globally,” Abiva added. The competitions are aimed at fostering the use of innovative ideas, coupled with the emerging potential of robotics-based solutions, in order to approach issues and solve problems, big or small. They are also seen nowadays as valuable, timely additions to school curricula. 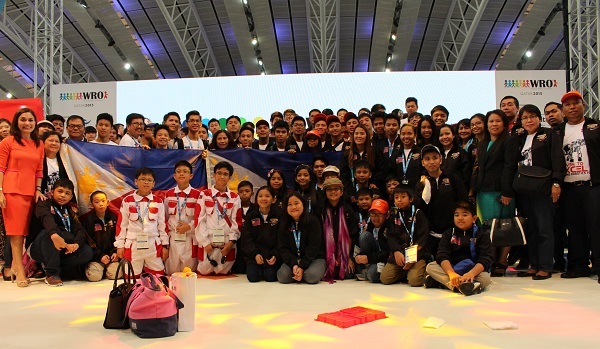 Last year, three teams composed of students from public schools in Makati City represented the country at the 11th World Robot Olympiad (WRO) in Sochi, Russia; while in WRO 2013, the Philippines won two silver medals (Dr. Yanga’s Colleges—junior high school and elementary level), two bronze medals (Grace Christian College —junior high and college level).